Pele in Giesing! 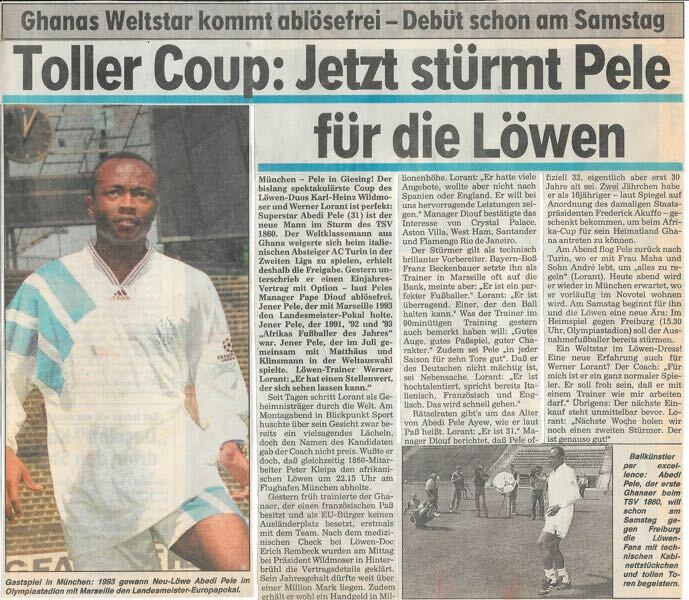 “A fantastic coup: Pele now plays for die Löwen,” were just some of the headlines in the Munich based papers 22-years ago. Abedi Pele, the namesake of the Brazilian star of the 1950s, 60s and 70s, had joined 1860 München. The 31-year-old, or 30-year-old or 32-year-old anyhow more on this later, Ghanaian attacking midfielder was the first true superstar to sign for 1860 München since the club’s golden era in the 1960s. The deal was made possible after his club Torino was relegated to the Serie B allowing 1860 to sign him on a free transfer. There was, however, a bit of trickery involved. President Karl-Heinz Wildmoser and head coach Werner Lorant worked tirelessly on this transfer. Wildmoser, a restaurant owner in Munich, was one of the most shrill personalities in Munich in the 1990s. Sporting a moustache and always good for a controversial statement the President ran the club like his fiefdom from 1992 to 2004. Wildmoser’s time would eventually come to an end in 2004 as he stumbled over 1860 München’s relegation to Bundesliga 2 and his suspected involvement in taking bribes as part of the construction of the Allianz Arena would eventually cost him his position. In the mid-1990s, however, he and head coach Lorant were like the two stooges as the two-some pushed 1860 forward into the club’s most successful period. In 1996 when 1860 announced the signing of Abedi Pele, however, 1860 were just back in the Bundesliga for their third season in a row. Die Löwen were improving in standing, but they were still some ways off the team that would almost qualify for the Champions League in 2000. Abedi Pele, in the meantime, had won the Champions League with Olympique Marseille in 1993 at the Munich Olympiastadion and was voted Africa’s football of the year in 1991, 1992 and 1993. “He had many offers, but he didn’t want to go to England or Spain. He wants to show what he can do playing for us,” Werner Lorant told the media at the time. “He is a perfect footballer,” his former head coach in Marseille and German legend Franz Beckenbauer told the media. “He is excellent. Someone who can hold the ball. He has a great eye, perfect passing play and is good for ten goals every season,” Lorant added. One of the biggest question marks at the time was his age. His agent claimed he was 31, but his passport said that he was 32 after Ghana’s President Frederick Akuffo changed his official age from 15 to 17 during his junior career to make him eligible early to play for the senior side. Akuffo was also to thank for turning Abedi Ayew into Abedi Pele. When handing out the new passport, Akuffo asked Abedi, what are you called. “People call me Pele,” Abedi answered, and Akuffo proclaimed “then that shall be your name.” It was a name change that opened many doors, and Abedi Pele became one of the biggest stars in African football. In 1982 he left Ghana for Qatar and via Switzerland and various smaller clubs in France eventually ended up at Olympique Marseille for whom he signed in 1987. A two-year loan stint aside Abedi Pele played six years for OM scoring 23 goals in 112 games winning the French title on two occasions and the Champions League. Following the Champions League triumph, Abedi Pele left OM, however. Beckenbauer had left him on the bench on to many occasions, and instead, he played one season in Lyon before he joined Italian side Torino in 1994. Up next were die Löwen in Munich. For 1860 this was a mega-transfer. Abedi Pele became only the second player after Piotr Nowak to earn over one million Deutsche Mark at the club. Furthermore, Wildmoser paid a signing bonus of over one million Deutsche Mark. It was a transfer that went against the very foundation of what 1860 were supposed to be. Whereas Bayern were, FC Hollywood Die Blauen were always considered a side that worked for football. A superstar for ein Arbeiterverein (a club of workers), how was supposed to work with the very ethos of the club? It was indeed a major debate at the time. Wildmoser and Lorant wanted success by any means. Furthermore, Wildmoser was often criticised for turning 1860 into an “FC Bayern Light” – especially after he moved the team from the Grünwalder Stadion in Giesing to the Olympiastadion to share a home with Bayern. That very debate about 1860’s identity rages on to the present day as the club is currently hoping to re-establish itself in Giesing. At the time, however, the debate was just at the beginning, and Wildmoser’s strong-armed politics and success on the pitch under the guidance of head coach Lorant meant that the discussion was always on the back burner. Abedi Pele joined a side that included the likes of 1994 World Cup star Daniel Bierofka, Horst Heldt, Miroslav Stević, Jens Jeremies, Bernhard Winkler and Olaf Bodden. Under Lorant, the side played similar hard working, but also attractive football, and would sensationally finish sixth in the Bundesliga qualifying the club for the UEFA Cup. And Abedi Pele? The Ghanaian midfielder would stay two years at 1860 München playing 57 games and scoring four goals and seven assists. Overall, his time at the club was a success but it was not an easy start for the Ghanaian star. Coming to Munich to a new environment playing for one of the toughest coaches in the league was not easy. “He is talented and already speaks Italian, French and English. His integration will be fast,” Lorant told the press on the day of his transfer. The reality, however, was that Abedi Pele struggled with the language, the climate and most importantly with the food. One particular difficulty was the Bavarian tradition of eating outside in beer gardens. “Eating under trees with staff falling into your food is cross”, Abedi Pele would later tell a club historian. Then there was also the general club culture. 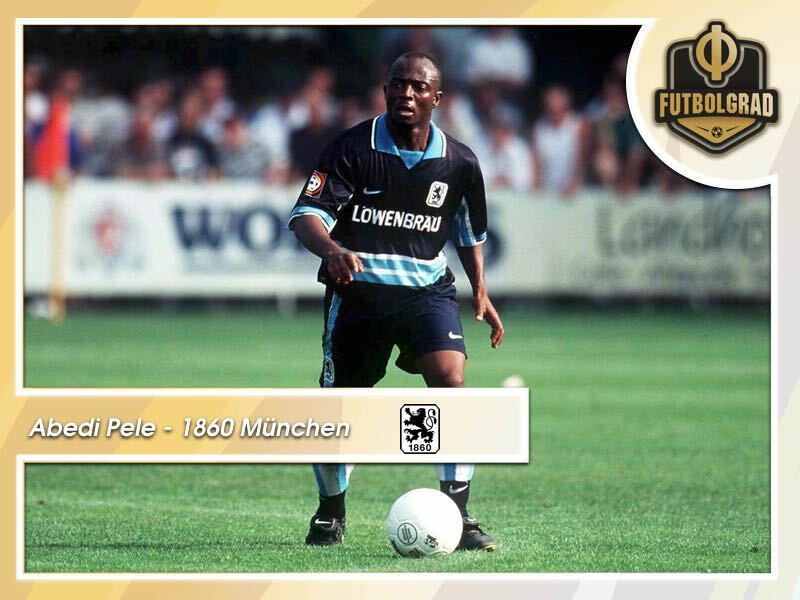 1860 München was relatively unknown abroad, and Abedi Pele believed he was signing for Bayern and not die Löwen when he was told about the move by his agent. It was a mistake that did not become apparent to him until he started training at the Grünwalder Straße rather than one block over at the Säbener Straße were Bayern have their ritzy training facility. Getting used to Lorant, however, was likely the hardest for Abedi Pele. I remember one particular game at the Grünwalder Stadion during the winter break against Dinamo Zagreb. It was a cold night, and an unforgiving friendly match and Abedi Pele was sitting on the bench when Lorant was going on one of his famous touchline rants. Throwing water bottles sprinting over to a poor Abedi Pele producing a ten-minute long monologue towards the Ghanaian midfielder, who sitting on the bench could not be blamed on what was happening on the pitch. After the winter break, however, Abedi Pele started to be fully integrated into the side and played 25 games overall that season. He then added another 25 games the following year, but towards the end of the season, he was showing signs of age. Furthermore, 1860 struggled for the most of the season fighting against relegation. That summer Werner Lorant and Wildmoser made wholesale changes to the squad, and Abedi Pele was among the players that left 1860. Abedi Pele in many ways put 1860 back on the map but also opened the doors on the debate on whether 1860 is a club for big-name players or should instead be a team relying on homegrown Munich-based players. As back then it is a debate that continues even as 1860 play in the third division. 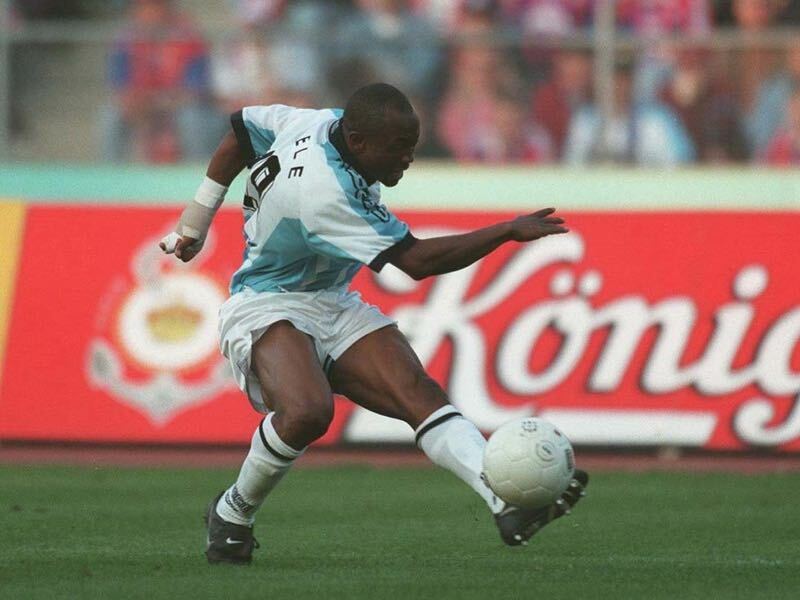 It is a hoak that Abedi Pele mixed Bayern Munich and TSV 1860 Munich. Completly nonsense – Please ask him for clarification.